This article gives an overview of the state-of-the-art #biomass-based hydrogen production technologies. Various biological and thermochemical processes of biomass are taken into consideration to find the most economical method of hydrogen production. 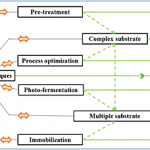 Biohydrogen generated by biophotolysis method, photo-fermentation and dark fermentation is studied with respect to various feedstocks in Malaysia. The fermentation approaches of biohydrogen production have shown great potential to be a future substitute of fossil fuels. Dark fermentation method is a simple biological hydrogen production method that uses a variety of substrate and does not require any light as a source of energy. A promising future for biohydrogen production is anticipated by this process both industrially and commercially. Feasibility of hydrogen production from pyrolysis and water gasification of various biomass feedstock confirm that supercritical water gasification (SCWG) of biomass is the most cost-effective thermochemical process. Highly moisturized biomass could be employed directly in SCWG without any high-cost drying process. Indeed, a small amount of energy is required to pressurize hydrogen in the storage tank because of highly pressurized SCWG process. The cost of hydrogen produced by SCWG of biomass is about US$3/GJ (US$0.35/kg), which is extremely lower than biomass pyrolysis method (in the range of US$8.86/GJ to US$15.52/GJ) and wind-electrolysis systems and PV-electrolysis systems (US$20.2/GJ and US$41.8/GJ, respectively). The best feedstock for biomass-based hydrogen production is identified based on the availability, location of the sources, processes required for the preparation of the feedstock and the total cost of acquiring the feedstock. The cheapest and most abundantly available biomass source in Malaysia is the waste of palm industry. Hydrogen production from palm oil mill effluent and palm solid residue could play a crucial role in the energy mix of Malaysia. Malaysia has this great capability to supply about 40% of its annual energy demand by hydrogen production from SCWG of palm solid waste. Copyright © 2015 John Wiley & Sons, Ltd. Utilization of biomass waste material, solid residue of craps, landfill gas and wood in hydrogen production scenario of Malaysia is helpful to obtain waste-to-well strategy. The cost of hydrogen produced by supercritical water gasification (SCWG) of biomass is extremely lower than biomass pyrolysis method, wind-electrolysis systems and photovoltaic-electrolysis systems. Around 40% of the energy demand of Malaysia could be supplied by SCWG of palm solid waste. Bio-hydrogen has great capability to be developed as a clean environmentally friendly energy carrier.